In the 18th century, the Theatre Royal was a place of scandal and controversy. In 1716 the future George II survived an assassination attempt in the theatre. Then in 1780 the Gordon Rioters attacked the theatre on account of its use of "papists and Frenchmen". In 1800, there was another royal assassination attempt, this time on George III. 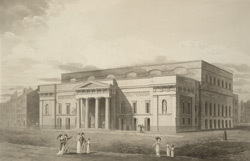 A new Henry Holland-designed theatre was built in the late-18th century, but it burned down in 1809.